Folks over at BGR have got hold of exclusive list of features, which they have been told are confirmed to be a part of the upcoming iPhone 4.0 Firmware. The next iPhone firmware is rumored to be very close, if not same as the OS on the rumored Apple Tablet. It is said to include multitouch gestures OS wide, multitasting (finally yay! ), lots of UI changes including a refreshed homescreen! and more syncing options for the native contacts and calendar apps. Features, as exactly detailed by the sources at BGR are as follows. Yesterday, Apple sent out loads of invites via email for the long rumored special event, which is scheduled to be held at 10 AM PST on January 27th, at the Yerba Buena Center for the Arts Theater in San Francisco. Apple is highly expected to unveil the long rumored Apple Tablet, the next-gen iPhone software dubbed as “iPhone 4”, and iLife 2010 at this mega event. The next-generation iPhone 4G however wont be the part of the event. One thing I would strongly like to see in the update is the ability to send a single txt message to multiple contacts easily. No more support for iPhone 2G? WTH?! Hopefully this will not come with that crazy new iBoot that limits you to a tethered jailbreak. Granted the new firmware will inherantly come with it’s own exploits. Lets hope apple dropped the ball and left a nice little loophole for a 4.0 Un-Tethered Jailbreak. The Android phones are the most like computer and the Iphone will never even come close useless it makes Itunes optional or completely dump it because itunes and the Iphone OS makes the Iphone usless without a computer. How can you even call the Iphone a smartphone if you have to have a computer to even make it work ? I'll pass on the Iphone 4G and keep my Nexus One and I'll get the Nexus Two when it comes out this summer. I am looking to buy Iphone3gs 16GB. Should I wait for OS4 release? Will the Inet Browsing speed improve with OS4? 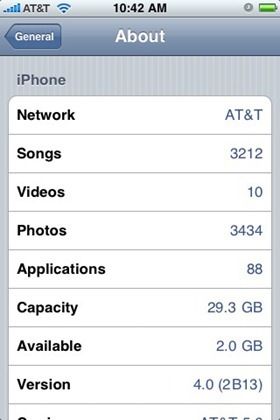 Can the Iphone 3gs be upgraded to OS4 thru a simple internet download? When is the new release date any one know? there is a program on cydia called “backgrounder” and “multifl0w” together you can get multi tasking….backgrounder rund apps in the back ground after u press the home button..and multifl0w lets u see wat apps are running by double pressing the home button. BUT this slows down the iPhone 3G alot, for example if you have an app running, you press home, it takes a good 2 seconds to actually get to the home screen. I think January 27th! but im not sure!